I made this small purse as I was learning how to do the crocodile stitch. I liked the stitch so much, I turned my learning sample into something practical. I saw how to do the crocodile stitch on a youtube video by Teresa. But the scales were rounded, like the ones in my first round, which is at the bottom of the purse. Then I saw another video which said to add ch 2 to the end of the scale to make it look more pointed. I did that from the second round up. I rather like how I managed to make the shape of the purse look rounded by folding an otherwise square bag. I added a button hole by (sc sc dc, ch 1 sk 1, dc sc sl st). 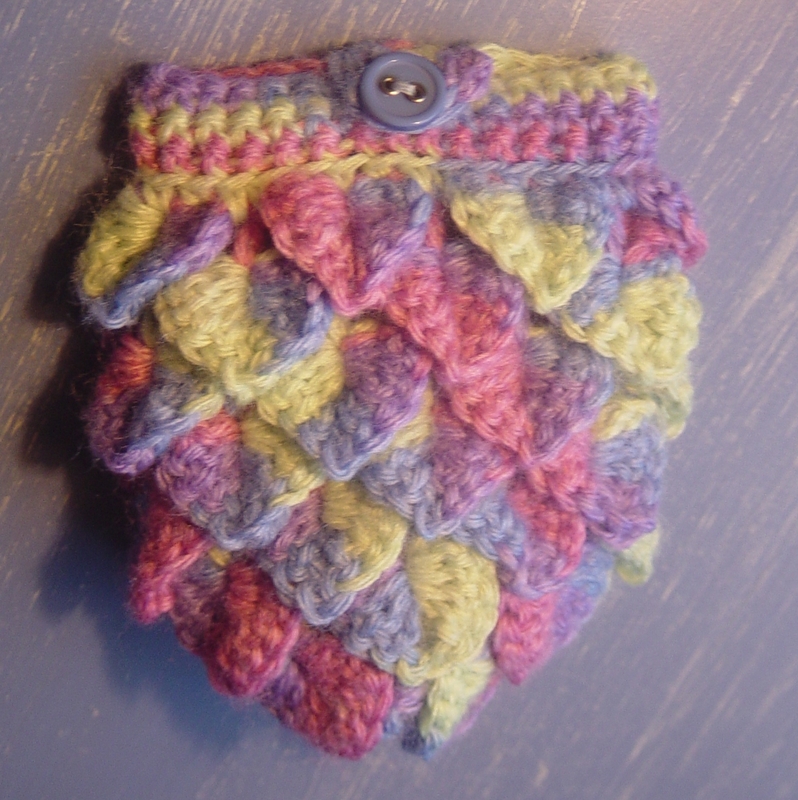 For this purse, I used a 3.5mm hook and some of the pretty variegated acrylic from Wangaratta Mill. I think this purse looks so cool, I'm going to carry it with me in my handbag as a small make-up purse. Hello to all my fellow Pink Saturdayers! I'm linking in with my favourite blog party hosted by How Sweet the Sound, be sure to check out this great blog party! Here are two other bloggers who link in with Pink Saturday that also like to crochet, check them out! Charlotte's Web - Oh Baby! Delightful pinks, Teena! So glad you visited me at The Writer's Reverie. Love all your home grown creativity. I'm hoping to move into just such a place in a bigger way when I change jobs this summer! Wish I'd learned to crochet - but glad my daughter did!! I love all crochet things. You are doing a very nice job. That is so sweet. There is something so pretty about crocheted items. Your work is beautiful! Beautiful! I have not tried this stitch yet. Happy Pink Saturday. love the purse....where is the information to create ?